Celebrating and highlighting the vibrant infusion of creativity and artistic engagement in a diverse, eco-conscious Jewish community. This art festival offers a wildly diverse array of opportunities to create, and engage with the arts. The Jewish Art Salon is represented by Richard McBee who will present Esther’s Day: Purim in Art and Hagar The Stranger. Yona Verwer will lead an Amulet Painting workshop and an illustrated discussion Revolutionizing the Jewish Art Community. 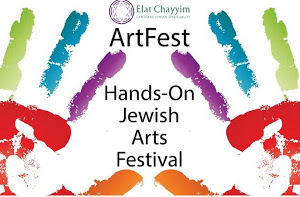 Patricia Eszter Margit of Art Kibbutz: Kabbalistic Sephirot and Enneagram in Jewish Fiction, and Creating successful Jewish public art projects with Art Kibbutz. Saul Sudin of Jewish Art Now presents Punk Jews Film Screening and Discussion, and Creator and Creation. Elizabeth Yaari leads Beyond Your Wildest Dream: Va-Yetse: Genesis: 28 v10-19, and Sanctuary Builders: Va-Yakhel: 35 v20-21. The Book of Ezekiel… and Zombies: Theatrical Research on Resurrection presented by Jesse Freedman and Bronwen Mullin of Meta-Phys Ed. Haifa Bint-Khadi leads The Inspirational Vision Box, Nature Journals for Families, and Authentic Visual Art Journaling. 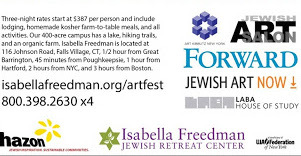 Partners: Jewish Art Salon, Art Kibbutz NY – International Jewish Artist Colony, Jewish Art Now, LABA: House of Study, Drisha Institute for Jewish Education’s Art’s Fellowship, Meta-Phys Ed.